Introducing dStors -- dCommerce Marketplace on Steem! dStors is a distributed commerce (dCommerce) platform built on the Steem blockchain that incentivizes both store owners and buyers with every successful transaction on the platform. The blockchain is still in its early days and is already paving the way for a new world with healthy, community-centric ecosystems. Over the past few years, we have seen several innovative and disruptive products and services built on the technology itself. E-commerce is a fascinating and well-established industry which, according to Statista.com, generated up to 2.3 trillion US dollars as global retail revenue in 2017 last year, and that value is expected to double up to 4.88 trillion US dollars by 2021. By integrating blockchain technology to eCommerce, the global market can be opened up to an even wider reach with better and faster payment models that are even more secure and trustless to a certain degree. Blockchain technology has the potential to remove conventional marketplace restrictions and is likely to positively affect the industry's market capacity beyond the aforementioned value by said year. Worth exploring! dStors is a distributed commerce (dCommerce) platform built on the Steem blockchain. It conceptualizes the idea of a decentralized, peer to peer eCommerce marketplace, with a mode of incentivization for both buyers and sellers! Think, eBay, Alibaba or Amazon powered by blockchain economy. Like I have already mentioned, dStors will be powered by blockchain technology, making it one of the earliest eCommerce marketplaces to utilize the technology. dStors will also be the first functional marketplace on Steem. The Steem blockchain is chosen because the platform has the features (such as transaction speed, scalability, activity incentivization, etc) that make it an ideal platform for building decentralized communities and applications. Also, the presence of a pre-existing and teeming database of users will boost brand recognition and put dStors (and in fact, any other well-designed blockchain project) in the limelight, automatically minimizing marketing and publicity costs! But of course, since dStors plans on building a world-class service, dStors will not be bound to Steem alone but will be accessible across-chains, most notably Whaleshares - A blockchain-based community for content incentivization. In general, dStors will allow for purchases to be made through cryptocurrencies such as Steem, WLS, BTS, etc, as well as fiat currencies between individuals and a secure escrow service provided by dStors inc. I believe this is a right step towards mainstream adoption of cryptocurrencies. dStors has all the perks of modern online market platforms and more. It makes all the difference with its new model - Giving incentives to both buyers and sellers through its utility token called STORS! STORS will be rewarded to both buyers and sellers upon the successful completion of transactions. The amount of STORS to be awarded will be determined by the prices of value transacted, and the dStors reputation score based on a number of successful transactions and customer ratings. Thus giving back value to both parties. According to a hypothetical example quoted on page 6 in the executive summary of the dStors Whitepaper, a successful transaction worth $250 between users can result in a reward of about 75 STORS. The rewards can either be sold on the bitshares DEX (Decentralized Exchange) for value or redeemed as upvotes for contents on the Steem and Whaleshares blockchains. The overall value of upvote could get as high as $45! That is close to 15% of the value of the transaction for both the buyer and seller! 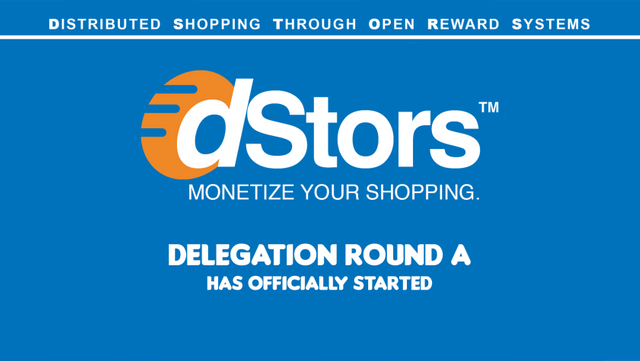 Also, to clarify the reputation system to be adopted, Founder/CEO @kaliju stated that dStors will also have the option of onboarding pre-existing stores from recognized online Marketplaces such as eBay, etc with their updated reputation from such sites. This simply means that a well established and recognized online store can expand to set-up a shop on dStors without having to worry about growing their reputation on the platform from the ground up. They just have to leverage on their current reputation on other online shopping platforms. This will increase trust between customer and seller, reduce the worry of fraud and scams, and as well take hold of the interest of such merchants/stores. Thus, drive value to Steem! Apart from the marketplace, dStors also plans to roll out several other products and services including a peer to peer cryptocurrency exchange, an Airbnb-style booking for lodgings, as well as fundraising activities and giveaway programs. More rewards for supporters through delegation -- One of the perks of building and investing on Steem is that it allows for projects to seek support from investors through the delegation (leasing out) of staked Steem (Steempower) without making them give away their Steem completely. Unlike conventional ICO models, the investor still controls his cryptocurrency. Hence, reducing the exposure to risks of fraud. By delegating a minimum of 500sp, investors receive dividends in STORS every 6 months. The ratio of STORS to SP is determined as shown in this post. Current ratio as of December 2018 is a 3:1. You get 3 STORS for every SP you delegate to dStors (upwards of the minimum amount of 500sp, of course). Also, there will be additional gifts and drops for community participation in the marketing and commercial arms of the project. The team has set aside 10% of the total 250 Million for this use. You can find out more are about the STORS token distribution on page 9-10 of the dStors Whitepaper. 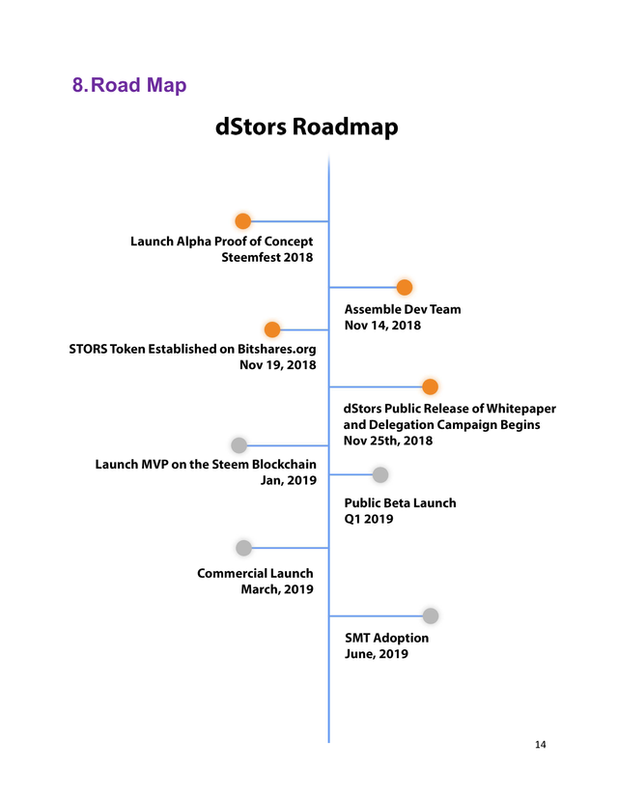 As evidenced in the image below, dStors is halfway through its roadmap, with the more critical work to be completed before the end of the first quarter of the next year 2019. I would like to wrap up with a few personal thoughts on dStors. I believe this is a very intriguing project. The token model and economics are well articulated in the whitepaper (which i have not covered entirely in this post), and the team behind the dStors project consists of recognized members of the Steem community as well as business experts with at least 15 years of high profile businesses amongst them. I also believe that given the right amount of work and innovative practices, with time, there will be hundreds and thousands of e-commerce traders/merchants from new and preexisting stores from established eCommerce platforms setting up on dStors. Hence, earning the project a fair share in the industry's Market Cap and in the long run, promote Steem! As always, it's best to make an investment decision after proving stated facts to be true. As such, all information was derived from the Whitepaper and from the answers provided to the questions asked by the general community! Check out the whitepaper below for proof and due diligence. @pangoli, thank you for your amazing post about @dstors. We truly appreciate the time you have spent researching about us and then writing your thoughts. Exciting things are happening on the blockchain an dStors is going to be leading the way. Thanks for the opportunity. I hope the project gains the right traction and soars with time. I look forward to transacting as soon as the platform is up and running! except it is misleading at best since no part of this will be built on the Steem Blockchain. A distributed trading platform within the Steem blockchain is a very interesting idea, the Steem blockchain is a technology that goes beyond just steemit, it is a technology with many benefits that can be exploited in many ways. dStors is a project worth following closely, thank you very much for the information. Expect great thing on here soon! Great explanation of some of the finer points of the dStors service! Good post! Very interesting. As soon as we are up and running we should check for synergies between @impactn and dStors. Today I would be especilly interested in how you include external reputation into your system. Is there anything written o that somewhere? Yes. the team will work on including that feature. I didn't go over the whitepaper with a fine-toothed comb entirely so I might have missed it if it was written. So, I asked some questions about the reputation system earlier today in the official discord server and I got this reply from the CEO. cool eh? You should join dStors on discord. There will be a live talk session in the coming days, so I've heard. questions are welcome. check out the end of my post for the link. Thank you..
dStors believes that the Steem Blockchain is primed to host hundreds of for-profit businesses. This should allow the transformation of a proof of blogging platform to proof of business!